Infi-Touch is a leading manufacturer out of the United States that provides low cost, high quality disposable gloves. For over 20 years, Infi-Touch has been providing the pharmaceutical, medical and automotive industries among others with their line of nitrile gloves and other types of disposable gloves and specialty products. Their products are designed to provide more protection against pollutants and harsh chemicals. The Infi-Touch brand promises the lowest prices with compromising the quality of the product. If you’re not satisfied, they offer a money-back guarantee. They take every precaution while manufacturing their product line of safety products. All disposable gloves carefully undergo either a chlorination process or are lined with double polymer to assure easy use. They are also checked for quality. All Infi-Touch medical grade gloves are approved by the FDA. The material nitrile is a synthetic polymer blend that doesn’t carry the same harsh proteins as latex, making them more desirable to individuals with allergies to the latex. Nitrile gloves provide better protection against chemicals and pollutants than latex. They are designed to have similar comfort and flexibility as latex gloves, conforming to the hand as body heat rises. Nitrile disposable gloves come with a textured surface, depending on the grade of the glove this texture may vary between light and harsh. This makes them more appealing to a wider variety of industries. The material is also 3 to 5 times more puncture and chemical resistant than other disposable gloves. 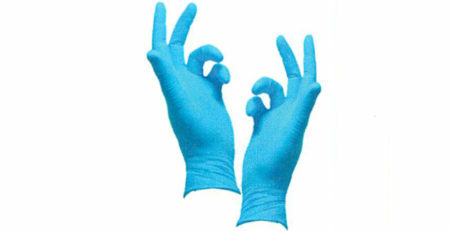 The Infi-Touch brand’s product line of nitrile gloves includes various colors, sizes and features. Most come with a double polymer lining and a powder-free surface. As of recent years, the FDA has banned powdered gloves in the medical industry due to the risks involved. Some of the Infi-Touch nitrile gloves even come with a beaded cuff for easier removal. 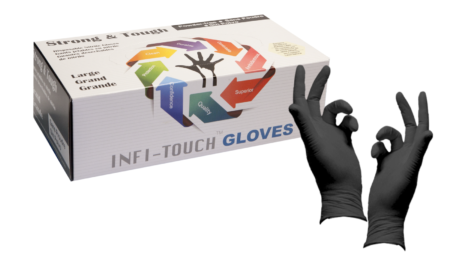 Under these categories, Infi-Touch has designed gloves to suit the functions of each job description. They assure their quality and design disposable gloves that are resistant to whatever pollutants they are made to protect against.